I’m a librarian – reading books is basically what I do for a living. Through my life there have been a handful of books that hit me – Colony of Unrequited Dreams, Anil’s Ghost and Fall on Your Knees are three that come to mind off the bat. 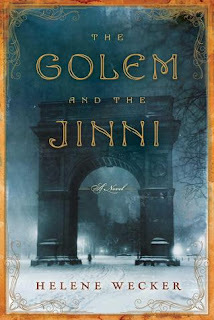 The Golem and the Jinni is one of those books, and I’m not saying that lightly. I was pre-disposed to like it I think – I loved the idea of mysticism, my Mom immigrated to NYC post WW2 as a child so the idea of a book set among the kind of romance of immigration (admittedly 50 years earlier) was one I could get behind. I love Jewish Folklore – hell, I love any folklore. I love historical fiction. I’m also the first to admit that I love New York. I do. I grew up spending summers there and I remember the beauty, hope and life that to me that city means. So what I’m saying is my pre-disposition to like the book scared me. I really really wanted to love it and was worried I was setting the book up to not be able to meet expectations. In no way did this book not meet expectations. One reviewer said the book humbled him – it humbled me too. Wecker’s debut (Guys, this is a debut novel. Seriously. When you read it you won’t believe it.) wove a story in the best possible tradition of storytelling. It’s magical realism at it’s absolute best. It’s heartbreaking, touching and quite possibly shows an almost staggeringly accurate ability to write characters that make you want to believe in fairy tales again. It’s about the struggle to fit in, to belong, to find place and meaning, to create a home, build a family, hope and future. Wecker’s ability to write meaningfully about feeling like you don’t know where your home is threw me – it wasn’t said but the longing felt by the characters of their memories was touching in its simple beauty. On a more surface level I plowed through the book, but I wouldn’t cash in on it as an ‘easy fast’ read, I just couldn’t put it down. The pacing is on the slower side (this isn’t a complaint in the least, Wecker pulled it out beautifully) and to be honest I was sad to come to the end of the book. The mysticism of the book was beautifully real, not forced and the details were in the subtleties. Basically I can’t wait to see what Wecker comes up with next. I loved this book. I loved this book so damn much. So full disclosure, I say in my reviews I’m a librarian. This is true. The more fun thing is my degree is actually a Masters of Information. Yes. 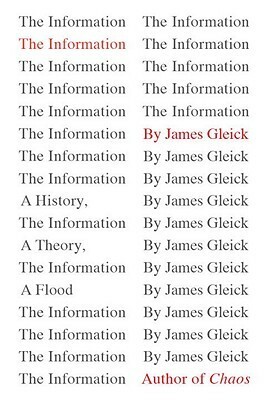 I am a Master of Information. This is a thing. So I got this book because how could I not? So yes I geeked out a million percent while reading this book, and my review is 100% biased in that this is a topic I love. So. Things about this book. 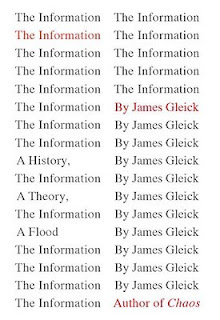 The title is exactly what the book is about the history of information which is SO DAMN FASCINATING because honestly guys, our ability to comprehend is staggering. How we transmit, perceive and underestimate information is fascinating. Seriously, it is and I don’t think just to people who generally geek out over it. Think about it – what we’re doing, understanding and thinking about not long ago would have been considered actual miracles. We can find out anything, and not only can we, but we now expect it to be easy. We can change, transmit, edit and argue over what information is and how we understand it and those of us who know are scared equally of the struggle to contain and provide access to it. To be honest again I actually picked up this book back when it was released in 2011 and I didn’t read it then because at the time I was just finishing up my Masters and honestly couldn’t emotionally handle the idea of reading anything else about it. But the thing is, I’m SO glad I found it and read it. I don’t think it’s written in a particularly high style, it was an easy-ish read and I sincerely think it’s worth a grab for everyone. This is cool stuff guys. 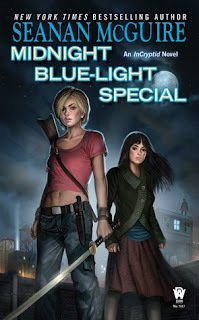 I actually feel like I write terrible reviews of Seanan McGuire's work. I say this in the best possible way, but it's because I genuinely have loved everything of hers I've read so I feel like it's a sort of repetitive "Yup. You should go read the book." So as I've said a million times, I love the October Daye series, and if somehow you aren't already reading it, you should go read it. So lets tackle this review from a different angle - why you should go read this series. First and foremost, because the series hasn't let me down yet - and I'm picky. I hate it when series start strong, and then just kind of taper off. I hate it because there's this obsessive compulsion in me to keep reading the stupid series because somehow I'm emotionally invested in these stupid characters who are making stupid decisions and doing stupid things and I'm annoyed but why can't I stop reading. We've all been there. But McGuire, gloriously, doesn't make me feel that. Her characters are lovely and human even though none of them are actually human. They grow and change and are flawed and learn and are broken and Well. Damn. Done. Toby is everything you want out of a heroine, guys, I'm not gonna get into it, but I think we're all guessing who Quentin's parents are, Tybalt is everything that is amazing with everything and just go read this damn series. She's also got at least 4 more books planned (for this series), which is basically amazing. Well Played Pullman. I think we can all agree that “His Dark Materials” was pretty fantastic. So I grabbed this because a) I enjoyed that series and b) I genuinely like books that touch on what life was like for Jesus – and I’m an Agnostic Jew (yes. We can do that). The problem is, that while I’m fully on team “Well Played Pullman” I fumble in that I didn't actually really enjoy this book. I had trouble getting through it for absolutely no good reason. It’s well written in an easy clearly laid out way. It’s not too long or too short and it’s a clever idea. So yes. “This is a story” as Pullman says, and Pullman is without a doubt a masterful storyteller. I like the slant he took, I like the mischief, I like how it held fairly true to the written gospels and I liked the Humanistic aspect the story took. But I didn’t love it. I’m not quite sure why. Wait. Wait. Hold the phones. Two posts, one day? Not a YA book? I know guys, it's confusing but it's still UF so we're probably still ok. The weird thing is the majority books I read aren't actually YA/UF. I just don't review them because I'm boring or something. So I love Seanan McGuire. This is not news, and not a secret, so by that logic this was a bit of a biased book choice on my part. I'm firmly on camp McGuire can do no wrong, and luckily this book didn't disappoint. So, here's the thing - I love her Rosemary and Rue series. Verging on slightly obsessive level of love. As in trying to figure out how I can get/beg/borrow/steal an ARC for Chimes at Midnight, but then is it awkward if I still buy a copy so it fits properly on my shelf? Because I'm weird like that. Anyways. The great thing about Midnight Blue-Light Special is that it's one of those rare books that outshines the original. Like I said in that review, I didn't love Discount Armageddon as much as I love her Rosemary and Rue series, but I thought it was a solid set up for the series. Turns out, I'm right. By I'm right, I mean McGuire is a fantastic writer, and I now have another series I love equally as much as Rosemary and Rue. Well Played Ms. McGuire. Well Played. Basically Verity Price is a fantastic heroine - she's charming and funny and loves what she does even though she sometimes wishes she didn't have to do it. Her best friend is the most human not human that I've ever read. She's apparently a giant psychotic bug who looks human but is supposed to be terrifying but is just really really appealing. So Cryptozoology. As a rule, I have little patience for it. Yes, I love faeries, the supernatural and everything else of the like, but Cryptozoology for some reason has always set my back up. I don't know why, but you know what, it works. Possibly because of the Aeslin Mice. Hail. Hail indeed. But all the supporting cast - the other Cryptids are everything that goes bump in the night (yes, including the Boogyman). Basically McGuire has the ability to world build in a way that makes it real - even when that reality is fantastically un-real. She's made reading about monsters fun since the first book of Rosemary and Rue, and for this series, actually made the monsters someone you'd want to have a coffee with. I am confused by this book. I am less confused by this book after I did some research and found out that it's the first book of a series. Excellent. 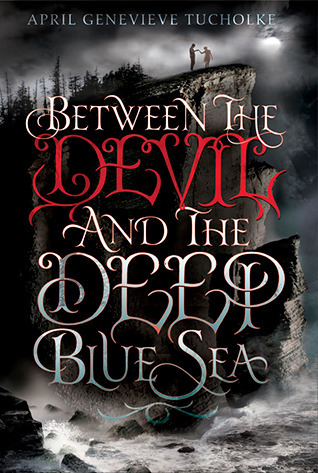 So I was fooling around on twitter one day (as I am wont to do) and I saw that there was a giveaway from Razorbill - it's absolutely no secret I've been on a YA book kick for the past few months (can't help it, what's coming out is awesome) and they were doing a giveaway for some new titles. 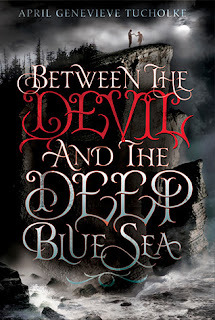 I did what I always do, googled for the plot, begged for the book, got nostalgic over a past job a Razorbill author and I shared, won the book and then got worried because I really really wanted to love the book, and that tends to end poorly for me. It's also no secret I tend to buy books for their covers. I know, I know, but I do. I not only really dug the cover, but I loved the title. I'm Newfie enough it was one of the phrases I remember hearing from my Grandpa fairly constantly and quite simply, I really wanted to be charmed by this book. Whelp (yes I went there) stars aligned and I was completely charmed by this book. Violet is charming, River is sufficiently dark and mysterious to make the teens and tweens smitten and even I half love him when I know I shouldn't. The character development is haunting - generally the novel is. I'm about to get really folky here guys - but the magic in this book is magical because it's not actual magic. It's the magic any of us raised by people who were raised with myth and legend can identify with - the local folk magic that's in what we wear, the shadows by our bed and the fact that we remember why you leave fairy bread out by the window. Tucholke manages to make the book creepy, disturbing and really you should probably read it with the lights on. I'm not going to get overly into it because it doesn't come out till August, but it's well worth reminding yourself to pick up a copy. So right off the bat, and to be perfectly clear Harper Collins Canada doesn't know who I am, there's pretty much no chance they'll even read this and I'm not writing it to give them publicity blah blah blah. I'm writing this for you - yes, you, one of the handful of people who's reading this, because for reasons beyond Marketing you should be paying attention to Harper Collins Canada's March Madness contest. HCC March Madness is basically a basketball tournament with books - 64 books that face off until one book is named ultimate champion of all of the books. Book vs. Book. Literary smack down for the ages. HCC is clever - along with one book crowned winner, one person wins all of the books. Ok, so why do you care? Other then winning 64 books (that I can impartially say over half of which actually rank on my list of favourite books ever- Amelia Bedelia, The Giving Tree, Mr. Penumbra's 24-Hour Bookstore, Hitchhikers Guide to the Galaxy, Goodnight Moon, The Gruffalo, To Kill a Mockingbird all made it past the first round, and I will say that a Tree Grows in Brooklyn being up against Stardust is basically a personal tragedy) which is damn cool, and minus the fact it's basically a popularity contest for books, the question of why we love what book is one that's just fun to think about. It's a pretty safe assumption that the majority of kids who grew up in Canada grew up being read the Giving Tree and The Gruffalo. Hitchhiker's Guide to the Galaxy made me love science fiction, and told me it's ok to be ridiculous sometimes. A Tree Grows in Brooklyn was the first book that made me cry. Mr. Penumbra's is a terrifyingly accurate snapshot of both where I want my career to go, and exactly where I am in life. Stardust will always break my heart in the best possible way. So beyond the marketing, I kind of love the idea of pitting The Giving Tree against Goodnight Moon because if you made me chose, I actually don't know which way I'd go. It's no easier to me to pit Goodnight Moon over To Kill a Mockingbird. Maybe it should be - American classic versus childhood memory. More to the point, it made me think if I actually had to chose one favourite book - I don't actually know what I would chose. Books that changed my life, books that shifted my worldview, books that made me feel better, not alone, I don't know which way I'd go. It's cool, I'm a Librarian, I know I'm a dork about this stuff. So I tend to have 0 expectations when it comes to books like this one other than I want it to be fun, and as far as I'm concerned Lerangis did that. I was impressed with the characters - the Professor (ha!) was clearly using the kids as pawns, but it's clear at times he cares for them more than he lets on. The kids also are very clearly kids, which is very well done on Lerangis' part. They all had their own personalities, questioned authority, fooled around and missed their parents. I think that's something that's often not mentioned, but it's a very real aspect of this book and a detail I appreciated. It seems a lot of the buzz about this book touches on how it was slow, did a lot of world building and people were a little confused as to where the series is going to go. I'm not going to argue with that, but I will throw in my two cents that the books target audience is middle school kids - and I think the topic is unfamiliar enough to that audience that a little world building for a series is probably a good thing. 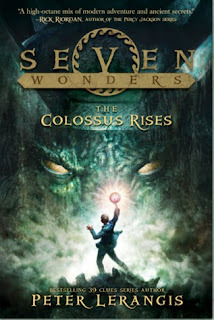 Basically the book is the beginning of the kids tracking down the seven powers - or seven wonders of the ancient world. I love this, because I'm enough of a history/classics geek and I think every kid should get to be awed by the ancient world once or twice. I also admittedly love searching for things that have been long lost to history - it throws in just enough reality to make a fantastical book plausible enough for imagination to go wild. I'm fairly sure this book was a set up for the series, and I certainly wasn't disappointed with it. I think it's appeal to a middle grade crowd is really strong - I feel that by the end of the book it was already setting itself up for a fun action filled ride, and I can't wait to see where they take the rest of the series. ***Full Disclosure - I received an ARC copy of this book from the publisher at OLA Super Conference, not specifically for reviewing but because they're promoting it to librarians. So I feel half bad about not getting my things together enough to do an early review, and then for doing a post-publication review on an ARC. Generally I'm fairly confident not enough has changed, but apologies none the less. So I wasn't sold on this book from day 1. The premise is the main character is pulled from her real life, into what appears to be a real life video game, where she has to eliminate an alien life form. Basically, kind of Hunger Games meets Books of Valor - so I was half sold, but half leery because this will either end fantastically, or in a slightly painful tug of war. So the thing is Silver pulls it off. 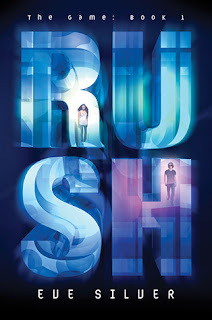 RUSH is a lot of fun - Miki is clueless, frustrated and terrified because there are aliens and what is going on because guys, aliens, but if you die in the game, you die in real life. Her teammates try and fill her in, but when she goes back to real life (I'm old, so I kept having Matrix flashbacks) she tries to find out what's going on but that's harder than she expected. Miki is a pretty great character - she knows how to fight and despite her being confused she picks up quickly - strong young female characters I'm generally a fan of, especially when authors don't fall into cliche's. I will say that this is the first of a series, and does end with a cliffhanger. We've discussed that this drives me insane. I get why authors do it, I think they have to do it, but you know. Insane. I think generally this is a book that teens can grab on to - first person shooter games, anime, MMO are all aspects that will grab the reader's interest. The originality of the book is also a draw - I certainly haven't read a book with a similar plot and I read a lot. I've recently been on a young adult specific book kick, and this one's plot stuck out (in a good way) when it comes to originality. I liked it because the book started out a bit slow, but that makes sense because the reader grows and learns with Miki - the pacing actually ended up being fantastic. 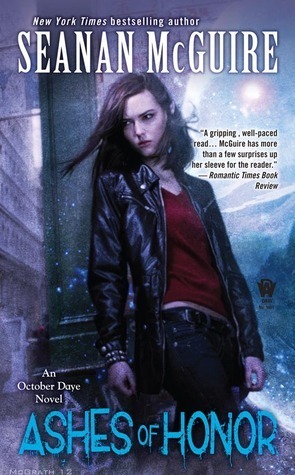 I would basically throw this book at any teenage reader - it's a refreshing change from the outright supernatural (even though I admittedly do love the supernatural). **I recieved an ARC copy at OLA Super Conference.